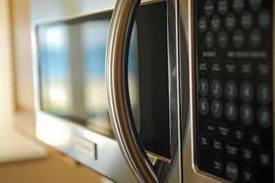 Is it time for microwave repair service in Cranford, New Jersey? If you are looking for a local company to provide you with efficient assistance, you have come to the right place. Our team is here to take care of all your needs in short order. So if your microwave isn’t heating well, is sparking, or won’t start, don’t rush to have it replaced and call us. As we have numerous local experts on the line, we can dispatch one of them to your place that very day. With years of hands-on experience in microwave repair Cranford service, the pro will quickly identify the problem and find the right solution that won’t break your budget! As a microwave oven can be quite hazardous, calling Appliance Repair Cranford NJ is exactly what you need in order to stay safe. But don’t try to fix the unit yourself by no means! Without proper expertise and equipment, you can only worsen the initial failure or even get an electrical shock. Why take chances? Once you give us a ring, we will appoint a local tech to assess your situation right away. By being trained to work on all existing models, the microwave service expert will quickly detect the source of the failure. Be it a defective motor, malfunctioning timer, or damaged turntable, the specialist will do whatever it takes to remedy the problem then and there. Would you like to invest in preventative microwave service? In today’s busy world, microwave ovens have taken the place they deserve amongst other vital home appliances. These small yet efficient units come in handy when you want to re-heat the leftovers or don’t have time to prepare dinner. However, without proper care, your appliance can let you down when you least expect it. So it makes sense to call our company for routine microwave service in Cranford. By checking your equipment on a regular basis, the tech will catch and address all potential issues before it’s too late. That way, you will be able to use your microwave safely whenever the need arises. For more details about our microwave repair in Cranford, please drop us a call today. We look forward to assisting you!